I started this blog because Lyme disease, at the time of this post and at the time of my diagnosis, is not acknowledged in the state of Montana. A reasonable amount of research shows reason for doubt, and just a tad more proves otherwise. But the claim of it’s absence kept me misdiagnosed for 3 extra years, eventually leading to the loss of my career. Had a I not believed state health department and CDC websites, and had my doctor not believed what she read, I would most certainly have looked harder at Lyme disease sooner. North Dakota discounted the presence of Lyme disease based on the same assumptions as Montana does currently, until they actually looked for deer ticks and found them (carrying Lyme). Montana patients (and citizens) are far from alone in this dangerous loophole. So, much of what I write (and much of what I push for behind the scenes in working with larger organizations) hopefully applies to other under-protected, under-informed, and under-recognized states as well. There are many pitfalls and obstacles to proper Lyme disease diagnosis and care globally, so this blog by no means sticks to the state of Montana, nor even to under-represented states. But, this post will stick to Montana from here forward (though you’ll see plenty of overlap if you live in a state not represented on CDC’s ‘distribution’ maps) and will be added to over time. It has been fascinating to watch each t.v. news story I can recall conclude with the same statement that Lyme disease has not yet reached the Rockies (in the rare instance that Lyme disease is covered, other than to state that we don’t have to worry about Lyme, but there are other tick born disease to be wary of–a few examples will be given at the end of this post). Fascinating is not a strong enough word for what I’ve read on agency websites and in agency publications. The most frustrating is an NIH document titled, “Looking for Lyme in all the wrong places” and I can’t help but wonder each time it comes up in search result what we might know if time and money were spent on research instead of propaganda. You will find my language and word choices have gotten stronger and stronger as the time since my proper diagnosis increases, and this an unavoidable consequence of an education in this illness and it’s politics. Standard tests are inaccurate and in Montana, they are often applied improperly, ineffectively, or not at all. The CDC and state health agencies state that no cases have been contracted in Montana, but this has not been appropriately investigated or tracked, and there are numerous (CDC positive) patients that contracted Lyme in Montana. Most patients have to travel out of state for proper diagnosis and care, regardless of where they contracted Lyme disease. Most Montana doctors are not familiar with Lyme disease. Lyme is a clinical diagnosis; laboratory tests can be useful confirmation but many patients with Lyme disease may test negative, especially on standard tests. Most doctors in Montana are not aware that Lyme is a clinical diagnosis, nor that tests are outdated and inaccurate, so that misdiagnosis, delayed care, and prolonged treatment are the most likely scenario for patients in Montana. 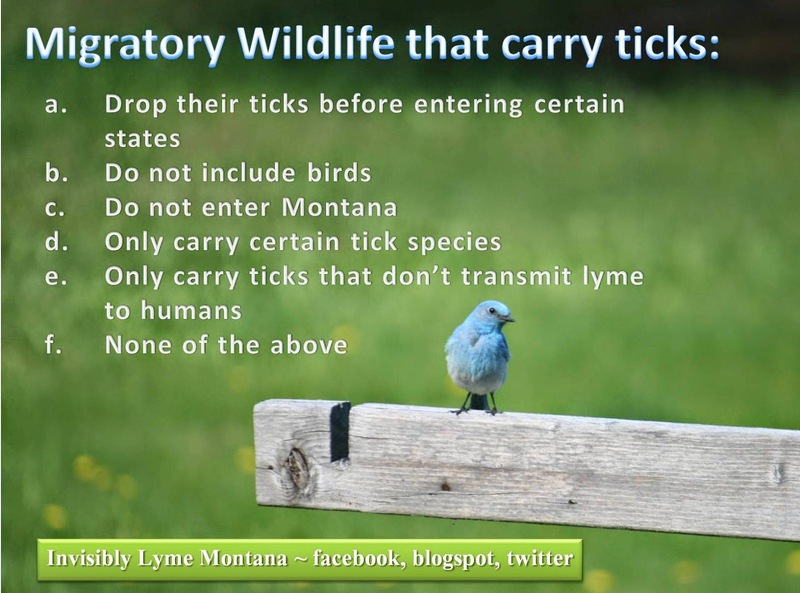 Although the lack of deer ticks is stated to be the reason why Lyme cannot be contracted in Montana, we are not currently surveying tick distributions, so we don’t know whether deer ticks are present or not. North Dakota stated the same thing until they surveyed for deer ticks—not only were they present at most sites, they were also carrying Lyme disease. Migratory birds carrying ticks enter the state from Lyme endemic areas every year and ticks are documented to be increasing their ranges. Deer ticks are not the only ticks that carry and transmit Lyme disease, and the list of non-tick vectors is growing. States not considered endemic are less likely to properly diagnose patients and the public is less likely to apply needed prevention measures, based on a study that found Montana least likely to identify Lyme disease of the states compared (Harrington et.al, 1997). The only study to investigate Lyme prevalence in Montana looked at Bitterroot County and recently found more cases than expected and cases that were likely contracted in Montana. There’s no end to the stories of loss and pain brought about by misdiagnosis. It may sound dramatic, but it’s not an overstatement, so please help in way you can—by learning, sharing your story, joining causes shared here that need help, or being ready to cast an informed vote. There is better science available and using it will help more Montanans receive answers and care. Although you will often hear and read that there is “no evidence” of various aspects of Lyme disease, you will quickly find that a) that is not the case, and b) if it were the case, that would not be a proper rationale for drawing and defending unsupported conclusions. If you are new to Lyme, you will have to see and learn for yourself over time that the basic tenets of science and logic fly out the window with the current CDC and IDSA (Infectious Disease Society of America) handling of Lyme (you find several articles on this blog giving background on the role the two have played in Lyme policy and the mishandling of Lyme disease in the U.S. so far). Related Illness from a Related Tick? These aren’t conclusively answerable at the present time, but should be on the radar of state health agencies. These would be applicable even if their current position on Lyme disease were partly or entirely correct, as these would still be critical to know in discerning that to be the case and in formulating effective surveillance and mitigation strategies moving forward. Which tick species are present in Montana? Are there seasonal distribution changes based on migratory species or other factors? How many of Montana’s tick species transmit Lyme disease to humans? Based on high profile peer reviewed research demonstrating the expansion of black legged ticks species continent wide, what new species should we expect are now present in Montana? 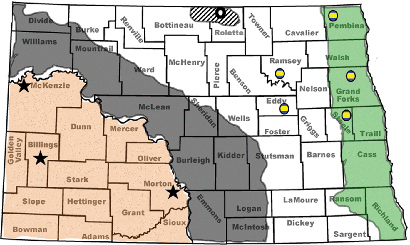 How soon can we expect tick survey efforts to occur, similar to those that found black legged ticks carrying Lyme in North Dakota during the winter of 2014/2015? How can we educate doctors to diagnose and treat Lyme disease here in the state of Montana? Why does our geography preclude proper testing for Lyme disease, and proper application of current diagnostic knowledge? How many Lyme patients live in Montana? How many Lyme patients are able to get Lyme literate care from an MD within the state of Montana? How many patients have to travel out of state for care? How many patients were told they did not have Lyme disease in Montana but were properly diagnosed out of state? How many patients have contracted Lyme disease in the state of Montana? If Lyme disease or black legged ticks were truly absent in Montana presently or in recent history, what is the mechanism by which you would become aware of their arrival? How will your state publications and websites be updated to reflect uncertainties based on past and present research, particularly the recent study that confirmed Lyme disease has been contracted in Montana? Why is there no record of the 1988 CDC confirmed case of Lyme contracted in Montana in state surveillance records? Why are so many CDC positive Lyme patients not showing up on surveillance maps? What were the results of research efforts investigating a potential Borellia species being transmitted via wood ticks? I believe that the state of Montana should be sued and found responsible for being a ground zero place of Lyme disease and other co-infections of ticks. 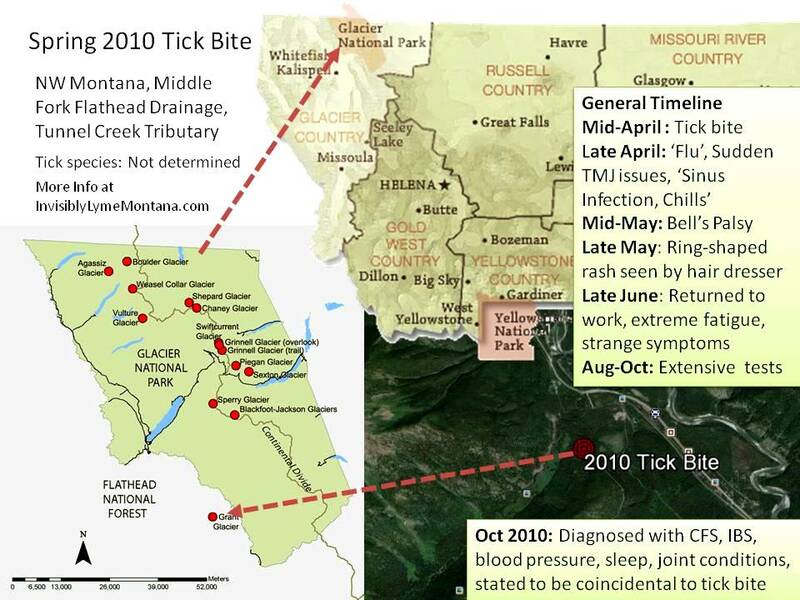 Sounds messed up that MT is known for Rocky Mountain Spotted Fever (a co-infection carried by ticks) but MT officials deny Lyme disease and to make things worse, the scientist Willy Burgdorfer who discovered RMSF in MT back in the early 70’s resided in Hamilton MT. This scientist I believe is responsible for releasing Lyme infected ticks into the MT wildlife not believing that the hard shell (deer ticks) could carry such bacteria and pathogens. It wasn’t until the mid 80’s that this scientist discovered that he was mistaken and that deer ticks are indeed a transmitter. I was bit by a tick in 1976 in Missoula MT and now decades later I am now disabled with neurological problems. I was bit in 2008 in OR and not diagnosed until 2009, it seems that my disabilities are extreme for only having been undiagnosed for a year. Lyme disease can stay dormant for years until agitated. I believe that I was infected with Lyme in MT in the early 70’s when this beloved scientist released his hard shell ticks that he didn’t believe were worth dissecting. MT is known for its outdoor activities year round, from hunting, fishing, camping, rafting and Everything Outdoors. That is MT’s bread and butter, god forbid they ruin their tourist income by informing the public of the true dangers of what ticks transmit. MT is Hiding a deadly secret and they will be exposed! How did you get diagnosed in MT…I am very sick and need urgent attention and have just been sent to an infection disease place in Missoula. If they aren’t going to properly diagnose me, I don’t want to waste my time…. Unfortunately, many of us have to leave the state to even receive proper testing. Many infectious disease doctors adhere to a set of guidelines (by IDSA) that are outdated and inadequate, which has caused many patients to fear ID doctors, because those guidelines can lead to misdiagnosis and can greatly limit appropriate care. Every doctor is different, though, and since the IDSA guidelines are no longer even published (on the national clearinghouse site for medical guidelines), an objective doctor would be willing to consider appropriate options outside those guidelines, including ILADS guidelines, which are published. Unfortunately, CDC still posts only IDSA, and many ID doctors still only adhere to IDSA. This makes treatment extremely hard to come by in our state, because even thorough testing and early care are discouraged in geographic areas like ours. The geographic issues seem to get in the way of the foremost issue of getting help. If you find an objective ID doctor, they would be a valuable resource. But most of us are initially told we don’t have lyme because we couldn’t get it here (without diligent tests and proper evaluation of clinical symptoms). If you can travel for at least initial testing and diagnosis, there are lyme literate MD’s on Seattle and at least two lyme literate ND’s elsewhere in the state. My lyme doctor is in Seattle. My doctors locally are learning through me, or are ones that know what complications to look for within their discipline. I have also been very sick for almost 2 years , have gone to a lot a specialists, blood work , mri’s, multiple er visits, have had to cut my work hours in less than half and every day is a struggle, no one has helped me and they say that I can’t have lyme disease but with all the research I have been doing I am sceptical. Wow, can’t imagine finding anything worthwhile in Missoula, especially in the medical profession. Lyme in my experience won’t be diagnosed anywhere unless you’re pushing for it. I’ve had it 47 years, my wife’s had in over 50 years, all three children are congenital Lyme and everyone absolutely thoroughly destroyed not half as much by Lyme as by the fraudulent diagnoses and treatments. Everyone except me, that is, I’ve done pretty well using the right vitamins and exercise and a particular anti bacterial agent, you don’t have to be destroyed by it. But only four months ago did I find out for certain I had Lyme. I got the Hell out of Missoula over 11 years ago. I’ve just finished a book about our Lyme nightmare as well, the least I can do after 47 years. http://foosresearch.com — GOOD LUCK. Thought I replied to this. I was born in Missoula, degree from UM, grad degree from MSU, 47 years suffered with Lyme. My wife had it longer, caught it as a child near Wolf Point. Three children born with congenital Lyme. Seriously doubt you’ll get any decent treatment in Montana, esp. Missoula, don’t let me say too much. We were never tested or diagnosed, it wasn’t until this year that I finally narrowed it down to Lyme and there can be no mistake. The MDs are trained to omit the right diagnostics and steer you another direction. My story is worth the read, visit my web site. I’ve been on top of the disease since 1886 and well able to function, still trying for a complete cure. I got it two years ago along the Tongue River just south of Miles City. I asked for the blood test and they found I was exposed. They were going to give me two weeks of the drug but I asked for four weeks. So far I am healthy and no symptoms. I am so glad you got tested and treated and that things are good! It was very smart to ask for longer!